Oh! Yes of course! My mistake!! Thanks for keeping us on track! Looking good so far Kevin. Thanks Jeremy- it’s been a little more if a hassle than I was anticipating but that’s always the way! All Good People I feel it is a great tune however in my area I call this tune Over Kill! and the reason I say this is this is one of those Yes songs that at the time when growing up in the Detroit area you would only here this tune being played on the radio. Remember there was no internet or satellite radio so as a true Yes fan I always wanted to here Anything but All Good People. My favorite version was and is the Yessongs version hands down. Sorry for the delay in my response. I didn’t realize you had left an episode comment here. Yes I agree the more Illisten to 3 ships…the more it comes across as a full out CChristmas album. It’s interesting. ..here in Toronto…Roundabout was the song that got overplayed…it’s funny what clicks in ddifferent parts of the world. I wish Kevin had also reviewed Chris Squire’s Swiss Choir album as his experience with choral music would have yielded some interesting insights. I haven’t listened to my copy of Something’s Coming in a long while–time to find it and listen. I do recall being amazed by Peter Banks’ live playing. It’s so interesting to think what Yes might have sounded like if he had stayed. He’s sort of a Moraz of the guitar in his sound, I think. Great call Brian. Swiss Choir is gorgeous, and over the years has become the first Christmas album I grab when the season hits. In fact, a little earlier than that as it contains a wonderful rendition of the song Come O’ Come Emmanuel, which is an advent piece. The orchestra, choir, and Fish’s bass are all phenomenal on this album. A 10 out of 10 for me. Having finally cleared the backlog of YMPs after I failed to keep up with the bumper fifth anniversary week, I’m now tracking them in real time, and so this week’s coverage of the ARW show at Birmingham really delighted me with its currency and immediacy. I think this is where the medium really comes into its own. You brought your fresh memories of the show and passed them on without filtering them through any agenda or cramming them into someone else’s narrative. I was thinking of you on Monday night and hoping you were having a good time. I’m glad you were! 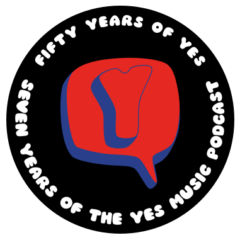 These are vividly interesting times to be a Yes fan, and you’re providing a brilliant anchor to each week’s events. I’m going to see ARW here in Edinburgh on Wednesday and I’ll share some observations afterwards. Thanks for becoming an essential part of my weekly listening. Hi Dave and thanks so much for the comments. I await your reactions to ARW with interest. I really hope they have sorted the sound out. Let us know! !